by Randall L. Eaton, Ph.D..
Who is the greatest conservationist in the history of the world? The answer is: "The best known hunter in the history of the world" - Teddy Roosevelt. What few people know is that he was the first man to write about women's rights, the subject of his senior thesis at Harvard. The paradox perplexes ecofeminists. Does hunting teach violence? What do you think Jimmy Carter and Nelson Mandela would say? They both received the Nobel Peace prize - and both are avid hunters. In a questionnaire survey I did of 2500 hunters, average age of 55, 97% male, I asked what events in their lives opened their hearts and engendered compassion in them. The prevailing choice by women was "becoming a parent", but for men it was, "taking the life of an animal". The polarities of human life consist of women bringing life into the world and men taking life to support life. For hundreds of thousands of years boys had to kill an animal of sufficient size to prove they could provide and thus qualify for manhood and marriage. Hunting is still the most profound rite of passage from boyhood to manhood. 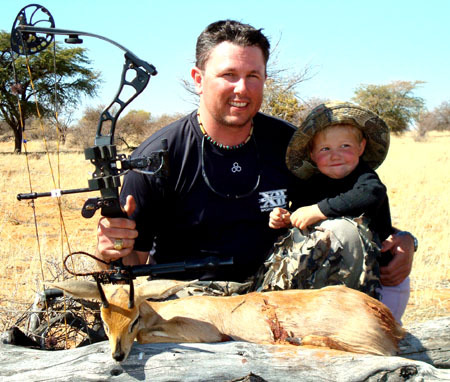 The same survey revealed that 82% of recreational hunters thank the animals they kill or the Creator. 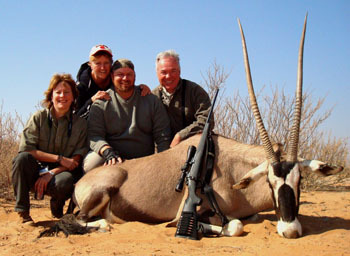 The words they chose to express how they feel about the animals they hunt were, "respect", "admiration" and "reverence". Not unlike Native American hunters. "Hunting is the ideal way to teach young people universal virtues including patience, generosity, courage, fortitude and humility." He defines humility as 'knowing you are part of something greater than yourself'. At one time Jacobs directed the largest wilderness center in the world for juvenile delinquents. 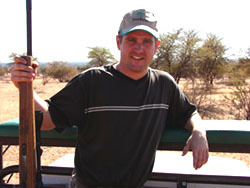 Troy Wittenbach with his bow-hunted Steenbok on Uitspan Hunting Ranch, Namibia. Isabella Duvenhage joined him for the picture! The most successful program ever conducted for juvenile delinquents was at the School for Urban and Wilderness Studies in Southern Idaho. For 13 years groups of boys went into the wilderness with nothing but a sleeping bag and a pocketknife. Their only food was what they could gather or catch and kill. According to follow-up surveys conducted one year after they left, 85% of the boys had not got into trouble during that year. Dr. Wade Brackenbury, who led the boys, is convinced that it was taking the lives of small animals for food that had the greatest influence on the boys' transformation. "Columbine never would have happened if those boys had been properly mentored in hunting and shooting." "Hunting teaches self-control and respect for life"
"Learning to use a firearm teaches responsibility." Dr. Scott Cutting, a psychologist in South Carolina, successfully used shooting to heal young men of serious aggression. A few years ago, the BATF and FBI conducted a study and could not find a single instance of a young person committing a felony with a legally owned firearm, which indicates that kids mentored in hunting and shooting, use firearms for the right reasons. Gurian, Jacobs, Smith and Rose all highly recommend and endorse hunting and shooting for youth. Which of the following well known Americans were hunters? That's right, all of the above. Did you know that hunters were the original environmental conservationists and they still lead in that field? Did you know that 700,000 members of Ducks Unlimited have successfully conserved over 12 million acres of wildlife habitat to the benefit of the entire living community of North America? That the Rocky Mountain Elk Foundation has conserved over four million acres and reintroduced elk throughout its former range in the midwest and eastern U.S.? That there may be more wild turkeys and deer in the U.S. than at any time in history? When the rest of the environmental community is waging rear-guard actions, the hunting community is on the offensive. The truth is that hunting is a model for sustainability. For those who participate directly in it the food chain becomes a love chain. Hunters put their money where their hearts are. Copyright 2007 by Randall L. Eaton, Advisor to Conservation Force. Contact dr. Eaton at Tel. 513-244-2826. He is starting an e-journal, "The Future of Hunting". As webmaster, I thank dr. Eaton for the permission to publish his article on this website. If you have enjoyed this article, read also other articles with reasons for hunting on our Hunting Articles-page. 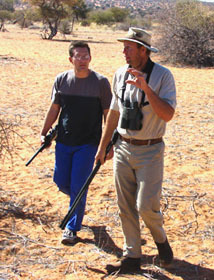 Read more about the Kalahari Bushmen Hunters.